CurateWP creates a new Custom Post Type which handles the creation and management of your curated sections. Because CurateWP uses a CPT for managing curated sections you gain the inherit benefits for WordPress posts and pages such as: post locking, post statuses, revisions, and publishing schedule. Click “Add Section” to get started adding your first curated section. You will see something resembling the screenshot above where you can start configuring your section. You might notice that the section edit screen is using the Classic Editor interface. This is to help facilitate the transition to the new Block Editor over time. There are currently two methods of adding content to your section: Manual and Automatic. When manually curating content you can search for specific content on your website to add. Start typing into the search field and content suggestions will show below that you can select. You may also filter by any post type available on your website. Once you’ve selected a piece of content, click “Add Post”. This will finalize the selection and add it to the content you’ve curated. 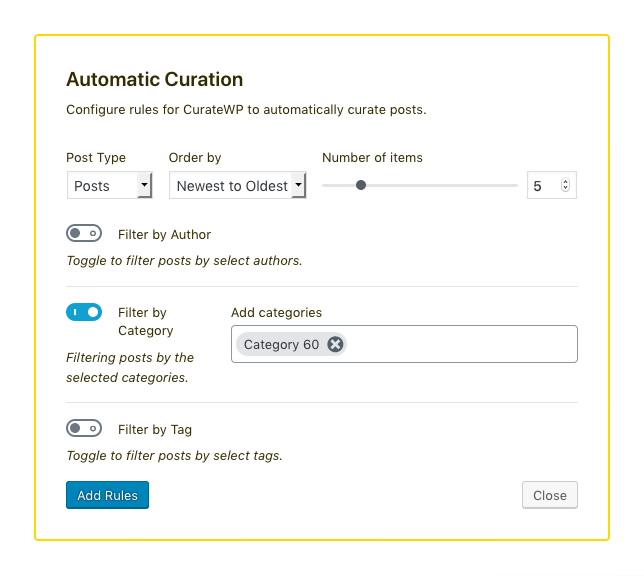 When configuring the rules for automatic curation you have a number of options to select from. Automatic curation is a simple way to tell WordPress how to select content from the database to display. 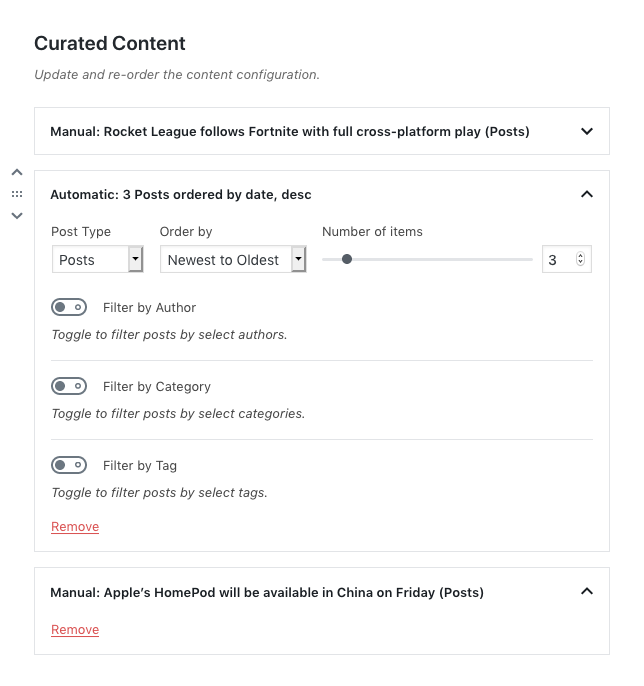 The first options allow you to filter content by any post type available on your website, order them by publish date or title, as well as limit the number of items to find. The next options in the form allow you to filter the content by authors, categories, and tags. Just click the toggle control next to the filter you want and search for values to apply. Currently filtering by authors, categories, and tags applies all of the filters together. For example curating the “Posts” post type with a filter by author “Elon Musk” and a filter by category “Short Sellers” will query for posts by the author “Elon Musk” and also have the category “Short Sellers”. An interface for managing more advanced queries is a planned feature for a future release. Under the “Curated Content” heading you will see all of the content you’ve curated in the section. You can sort the content into the order you see fit or remove content that isn’t relevant anymore. If you’ve added automatically curated content you can update the configuration here. Your changes will be reflected within the CurateWP interface immediately but they will not be live until you click update or publish the section. 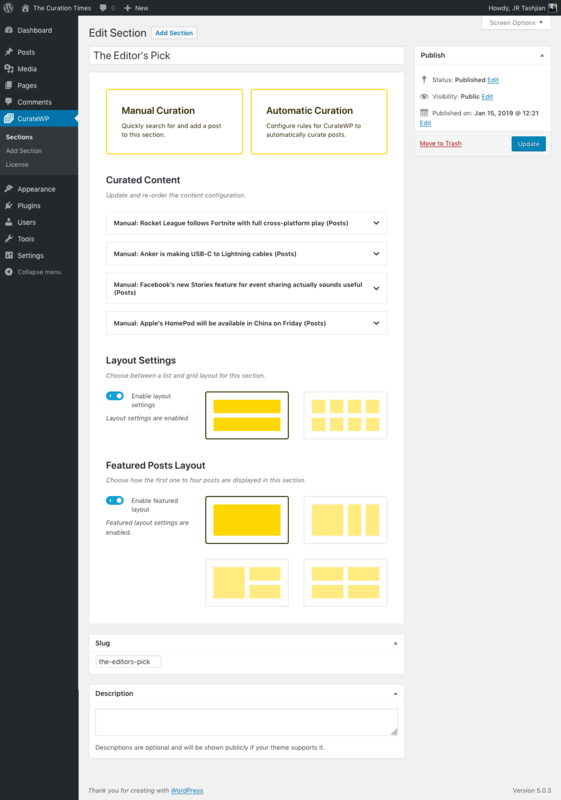 Continue on to learn how to configure layouts for your curated content that CurateWP provides.